This paper argues that the methods used by the establishment climate science community are not fit for purpose and that a new forecasting paradigm should be adopted. Earth's climate is the result of resonances and beats between various quasi-cyclic processes of varying wavelengths. It is not possible to forecast the future unless we have a good understanding of where the earth is in time in relation to the current phases of those different interacting natural quasi periodicities. Evidence is presented specifying the timing and amplitude of the natural 60+/- year and, more importantly, 1,000 year periodicities (observed emergent behaviors) that are so obvious in the temperature record. Data related to the solar climate driver is discussed and the solar cycle 22 low in the neutron count (high solar activity) in 1991 is identified as a solar activity millennial peak and correlated with the millennial peak -inversion point - in the RSS temperature trend in about 2003. The cyclic trends are projected forward and predict a probable general temperature decline in the coming decades and centuries. Estimates of the timing and amplitude of the coming cooling are made. If the real climate outcomes follow a trend which approaches the near term forecasts of this working hypothesis, the divergence between the IPCC forecasts and those projected by this paper will be so large by 2021 as to make the current, supposedly actionable, level of confidence in the IPCC forecasts untenable. 1. The Problems with the IPCC - GCM Climate Forecasting methods. Climate forecasts are made by the IPCC using analytic numerical models called General Circulation Models (GCMs) which attempt to describe the climate dynamics using sets of differential equations. This modelling approach is of limited value for predicting future temperature with any calculable certainty because of the difficulty of sampling or specifying the initial conditions of a sufficiently fine grained spatio-temporal grid of a large number of variables with sufficient precision. In addition, Essex 2013 (1) proved that models with the number of variables in the GCMs are simply incomputable. 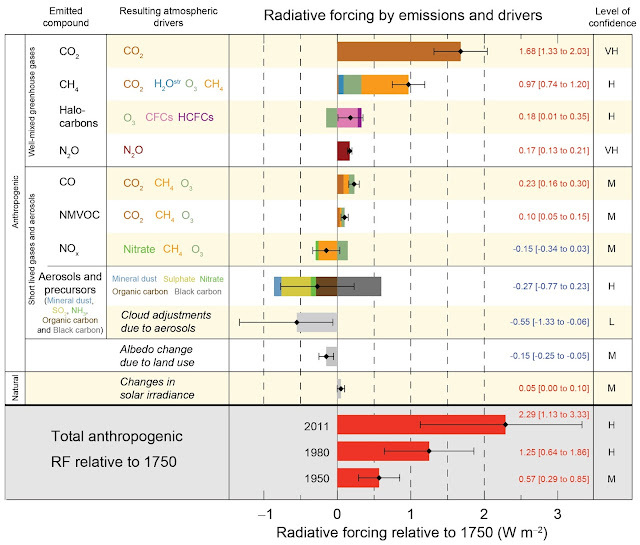 The IPCC AR5 WG1 SPM report Fig 5 shows how the models are structured and the latest IPCC estimates of Radiative Forcing by emissions and drivers (2). For the atmosphere as a whole therefore cloud processes, including convection and its interaction with boundary layer and larger-scale circulation, remain major sources of uncertainty, which propagate through the coupled climate system. Various approaches to improve the precision of multi-model projections have been explored, but there is still no agreed strategy for weighting the projections from different models based on their historical performance so that there is no direct means of translating quantitative measures of past performance into confident statements about fidelity of future climate projections.The use of a multi-model ensemble in the IPCC assessment reports is an attempt to characterize the impact of parameterization uncertainty on climate change predictions. The shortcomings in the modeling methods, and in the resulting estimates of confidence levels, make no allowance for these uncertainties in the models. In fact, the average of a multi-model ensemble has no physical correlate in the real world. What could be clearer? The IPCC itself said in 2007 that it doesn’t even know what metrics to put into the models to test their reliability. That is, it doesn’t know what future temperatures will be and therefore can’t calculate the climate sensitivity to CO2. This also begs a further question of what erroneous assumptions (e.g., that CO2 is the main climate driver) went into the “plausible” models to be tested any way. The IPCC itself has now recognized this uncertainty in estimating CS – the AR5 SPM says in Footnote 16 page 16 (5): “No best estimate for equilibrium climate sensitivity can now be given because of a lack of agreement on values across assessed lines of evidence and studies.” Paradoxically the claim is still made that the UNFCCC Agenda 21 actions can dial up a desired temperature by controlling CO2 levels. This is cognitive dissonance so extreme as to be irrational. There is no empirical evidence which requires that anthropogenic CO2 has any significant effect on global temperatures. The climate model forecasts, on which the entire Catastrophic Anthropogenic Global Warming meme rests, are structured with no regard to the natural 60+/- year and, more importantly, 1,000 year periodicities that are so obvious in the temperature record. The modelers approach is simply a scientific disaster and lacks even average commonsense. It is exactly like taking the temperature trend from, say, February to July and projecting it ahead linearly for 20 years beyond an inversion point. The models are generally back-tuned for less than 150 years when the relevant time scale is millennial. The radiative forcings shown in Fig. 1 reflect the past assumptions. The IPCC future temperature projections depend in addition on the Representative Concentration Pathways (RCPs) chosen for analysis. The RCPs depend on highly speculative scenarios, principally population and energy source and price forecasts, dreamt up by sundry sources. The cost/benefit analysis of actions taken to limit CO2 levels depends on the discount rate used and allowances made, if any, for the positive future positive economic effects of CO2 production on agriculture and of fossil fuel based energy production. The structural uncertainties inherent in this phase of the temperature projections are clearly so large, especially when added to the uncertainties of the science already discussed, that the outcomes provide no basis for action or even rational discussion by government policymakers. The IPCC range of ECS estimates reflects merely the predilections of the modellers - a classic case of “Weapons of Math Destruction” (6). Harrison and Stainforth 2009 say (7): “Reductionism argues that deterministic approaches to science and positivist views of causation are the appropriate methodologies for exploring complex, multivariate systems where the behavior of a complex system can be deduced from the fundamental reductionist understanding. Rather, large complex systems may be better understood, and perhaps only understood, in terms of observed, emergent behavior. The practical implication is that there exist system behaviors and structures that are not amenable to explanation or prediction by reductionist methodologies. The search for objective constraints with which to reduce the uncertainty in regional predictions has proven elusive. The problem of equifinality ……. that different model structures and different parameter sets of a model can produce similar observed behavior of the system under study - has rarely been addressed.” A new forecasting paradigm is required. 2. The Past is the Key to the Present and Future. Finding then Forecasting the Natural Quasi-Periodicities Governing Earth’s Climate - a Geological Approach. The core competency in the Geological Sciences is the ability to recognize and correlate the changing patterns of events in time and space. This requires a set of skills different from the reductionist and mathematical/statistical approach to nature, but which is essential for investigating past climates and forecasting future climate trends. It is necessary to build an understanding of the patterns and a narrative of general trends from an integrated overview of the actual individual local and regional time series of particular variables. Earth’s climate is the result of resonances and beats between various quasi-cyclic processes of varying wavelengths. It is not possible to forecast the future unless we have a good empirical understanding of where the earth is in time in relation to the current phases of those different interacting natural quasi periodicities which include the principal components of the observed emergent phenomena. When analyzing or comparing data time series geologists refer to a stratigraphic unit that serves as the standard of reference as a “type section”. In climatology it is useful when illustrating hypotheses to talk in terms of “type reconstructions”. Mann’s “Hockey Stick” is the iconic example. It is necessary also to be cognizant of the fact that the emergent time series will reflect turning points and threshold effects in the underlying physical process interactions. Such turning points mark the major inflection points in temperature and solar activity time series and serve as geologists would say as “golden spikes” when analyzing and forecasting temperature and solar activity trends. Fig. 2 shows that Earth is past the warm peak of the current Milankovitch interglacial and has been generally cooling for the last 3,500 years. The millennial cycle peaks are obvious at about 10,000, 9,000, 8,000, 7,000, 2,000, and 1,000 years before now as seen in Fig. 2 (8) and at about 990 AD in Fig. 3 (9). It should be noted that those believing that CO2 is the main driver should recognize that Fig. 2 would indicate that from 8,000 to the Little Ice Age CO2 must have been acting as a coolant. 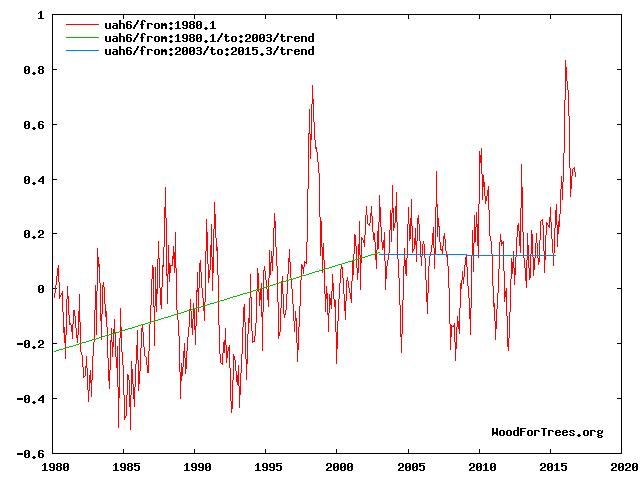 Any discussion or forecast of future cooling must be based on a wide knowledge of the most important reconstructions of past temperatures, after all, the hockey stick was instrumental in selling the CAGW meme to the grant awarders, politicians, NGOs and the general public. The following papers trace the progressive development of the most relevant reconstructions starting with the hockey stick: Mann et al 1999. Fig. 3 (10), Esper et al 2002 Fig. 3 (11), Mann’s later changes - Mann et al 2008 Fig. 3 (12), and Mann et al 2009 Fig. 1 (13). The later 2012 Christiansen and Ljungqvist temperature time series of Fig. 3 is here proposed as the most useful “type reconstruction” as a basis for climate change discussion. For real world local climate impact estimates, Fig 3 shows that the extremes of variability or the data envelopes are of more significance than averages. Note also that the overall curve is not a simple sine curve. The down trend is about 650 years and the uptrend about 364 years. Forward projections made by mathematical curve fitting have no necessary connection to reality, particularly if turning points picked from empirical data are ignored. Figure 4 illustrates the working hypothesis that for this RSS time series the peak of the Millennial cycle, a very important “golden spike”, can be designated at 2003. The Hadcrut 4gl data trends are very similar to the UAH data trends with the millennial peak at 2005.3 in Fig. 5 (15). 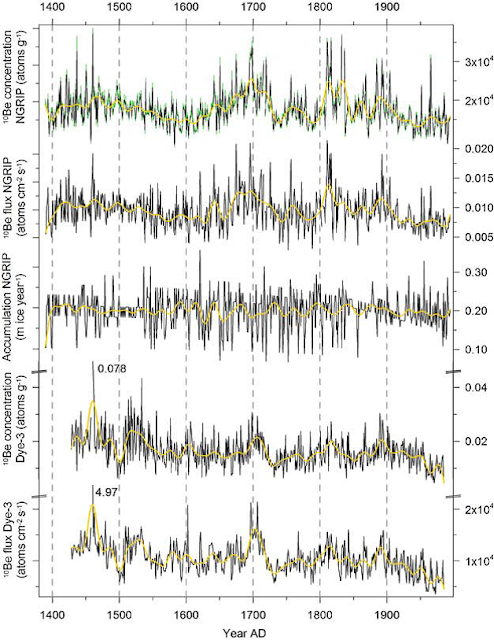 Fig.6 A comparison of the periodograms of (a) the Holocene sunspot activity with (b) time converted periodograms of the Miocene proxy data (19). 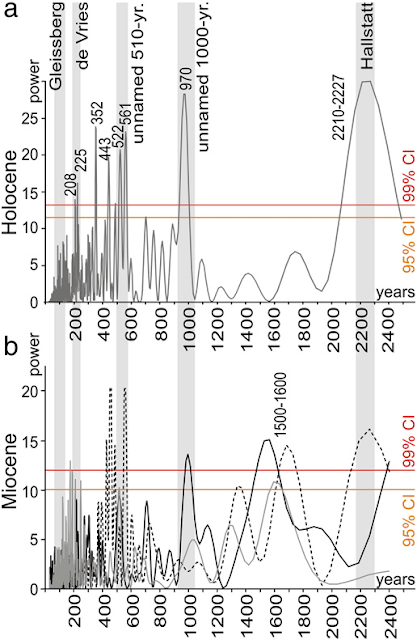 Kern 2012 (19) presents strong evidence for the influence of solar cycles during the Holocene and in a Late Miocene lake system. It is noteworthy that the Millennial periodicity is persistent and identifiable throughout the Holocene Figs. 2 and 6 and in the Miocene - 10.5 million years ago Fig.6. The prominent Millennial unnamed peak in Fig. 6a above is also seen in Scaffetta’s Fig. 10 in the C-14 data (20) and is correlated with the Eddy cycle with a suggested period of 900 to 1050 years. 2.3 The Quasi-Millennial Temperature Cycle – Amplitude. 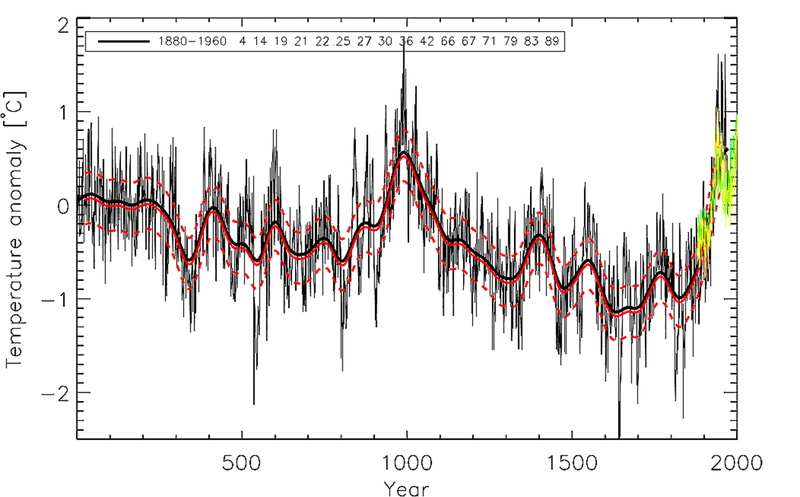 An estimate of the average amplitude of the NH temperature Millennial cycle can be made from the 50-year moving average curve (red) of Fig. 3 above. 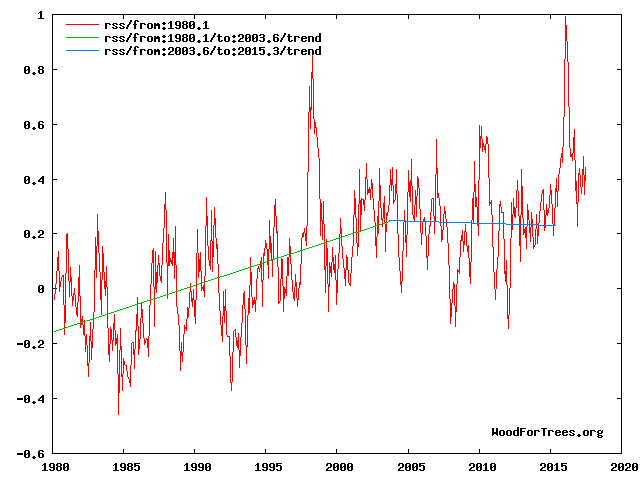 It is about 1.7 degrees C from the 990 peak to the LIA minimum at about 1640. This is entirely consistent with the Northern Hemisphere estimates of Shindell (21), and with the Arctic amplitude reported by Mckay et al 2014 (22). (a) Reconstruction calculated using the original (black) and updated database presented here (red). (b) Scatter plot illustrating the influence of the revisions; 1:1 line shown in red. 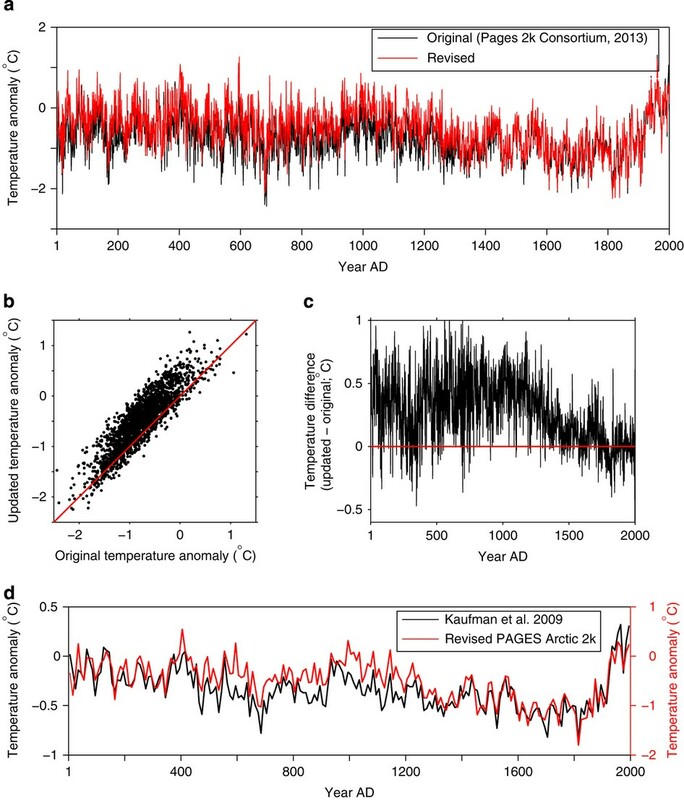 (c) Time-series of the differences in reconstructed temperature (revised—original); no change shown as red line. (d) Comparison between Kaufman et al. 7 Arctic—wide temperature reconstruction and the revised PAGES 2k Arctic reconstruction (averaged to decadal values). Note the factor-of-two difference in the temperature scales. It is important to note that in Fig. 7d the end 20th century warming peaks at about the same temperature as the MWP peak at about 1,000 AD, contrary to the expectations of the CAGW establishment. Over the last 135 years an approximate 60 year periodicity is clearly present in the temperature data. 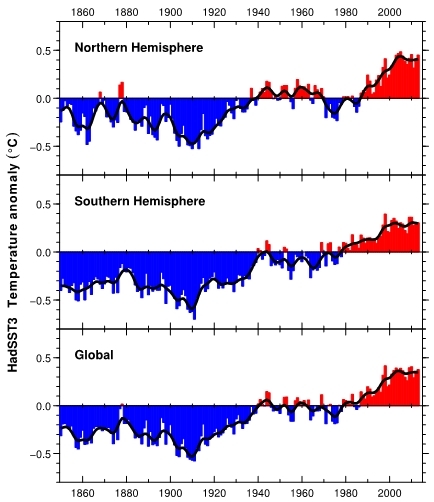 The global SST data shows cooling from 1880 to 1910, warming from 1910 to 1944, cooling from 1944 to 1974, warming from 1974 to 2004 and cooling since then. This 60-year +/- periodicity in Fig. 8 modulates the underlying longer wave 1,000-year periodicity seen in Figs. 3, 6 and 7 above by about 0.5 degrees per 60-year cycle. This 60-year cycle is also well documented in Figs.1 and 3 in the Scaffetta paper referenced previously (18) and in Fig. 2a and b Gervais 2016 (24), which paper also suggests a TCR of 0.6 and questions the entire dangerous warming paradigm. The most useful proxies for solar “activity” are the 10Be data and the Neutron count. The general increase in solar activity since the Little Ice Age is obvious in the decrease in the NGRIP and Dye -3 ice core 10 Be flux data between about 1700 and the late twentieth century. Steinhilber Figure 3 BCD (26) shows the correlation of the various climate minima within the last 1,000 years to 10Be cosmic ray intensities. Temperature drives CO2, water vapor concentrations, and evaporative and convective cooling independently. The whole CAGW - GHG scare is based on the obvious fallacy of putting the effect before the cause. Unless the range and causes of natural variation, as seen in the natural temperature quasi-periodicities, are known within reasonably narrow limits it is simply not possible to even begin to estimate the effect of anthropogenic CO2 on climate. Given the lack of any empirical CO2-climate connection reviewed earlier and the inverse relationship between CO2 and temperature seen in Fig. 2, and for the years 2003– 2015.3 in Fig. 4, during which CO2 rose 20 ppm, the simplest and most rational working hypothesis is that the solar “activity” increase is the chief driver of the global temperature increase since the LIA. Based on Fig. 9 and the Oulu neutron count in Fig. 10 (27) and the evidence for the temperature peak from Figures 3, 4, and 5, it is reasonable to conclude that the solar activity millennial maximum peaked with a solar activity “Golden Spike” in Cycle 22 at about 1991. The connection between solar “activity” and climate is poorly understood and highly controversial. Solar “activity” encompasses changes in solar magnetic field strength, IMF, GCRs, TSI, EUV, solar wind density and velocity, CMEs, proton events, etc. The idea of using the neutron count and the 10Be record as the most useful proxy for changing solar activity and temperature forecasting is agnostic as to the physical mechanisms involved. Having said that, however, it seems likely that the three main solar activity related climate drivers are the changing GCR flux - via the changes in cloud cover and natural aerosols (optical depth), the changing EUV radiation producing top down effects via the Ozone layer, and the changing TSI - especially on millennial and centennial scales. The effect on observed emergent behaviors i.e. global temperature trends of the combination of these solar drivers will vary non-linearly depending on the particular phases of the eccentricity, obliquity and precession orbital cycles at any particular time convolved with the phases of the millennial, centennial and decadal solar activity cycles and changes in the earth’s magnetic field. Because of the thermal inertia of the oceans there is a varying lag between the solar activity peak and the corresponding peak in the different climate metrics. There is a 13+/- year delay between the solar activity “Golden Spike” 1991 peak and the millennial cyclic “Golden Spike” temperature peak seen in the RSS data at 2003 in Fig. 4. It has been independently estimated that there is about a 12-year lag between the cosmic ray flux and the temperature data - Fig. 3 in Usoskin (28). The global millennial temperature rising trend seen in Fig11 (29) from 1984 to the peak and trend inversion point in the Hadcrut3 data at 2003/4 is the inverse correlative of the Tropical Cloud Cover fall from 1984 to the Millennial trend change at 2002. The lags in these trends from the solar activity peak at 1991-Fig 10 - are 12 and 11 years respectively. These correlations suggest possible teleconnections between the GCR flux, clouds and global temperatures. By contrast, the lag between the solar activity peak at 1991 and the Arctic sea ice volume minimum is 21 years (30). It is simple and natural to correlate the cycle 22 low in the neutron count (high solar activity) in 1991 with the millennial temperature peak and trend inversion in the RSS in 2003 with the solar activity 1991 Golden Spike, and to project forward a probable general temperature decline for the coming decades and centuries. Lags differ between data sets because of the real geographical area differences, proxy data point selection differences and instrumental differences between different proxy time series. The depths of the next LIA will likely occur about 2640 +/-. In the real world no pattern repeats exactly because other things are never equal. Look for example at the short-term annual variability about the 50-year moving average in Fig. 3. The actual future pattern will incorporate other solar periodicities in addition to the 60-year and millennial cycles, and will also reflect extraneous events such as volcanism. However, these two most obvious cycles should capture the principal components of the general trends with an accuracy high enough, and probability likely enough, to guide policy. Forward projections made by mathematical curve fitting alone have no necessary connection to reality if turning points picked from empirical data in Figs 4 and 10 are ignored. Fig. 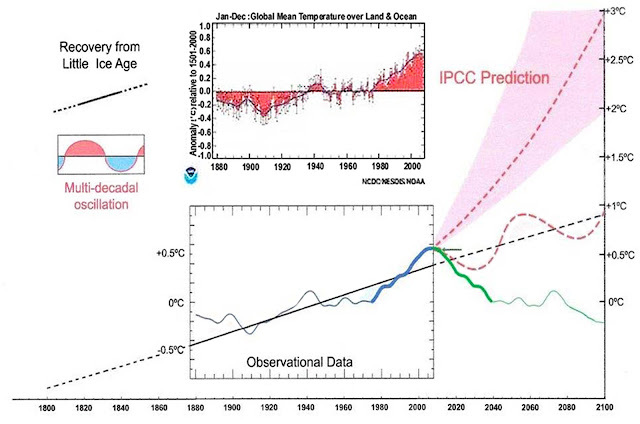 12 compares the IPCC forecast with the Akasofu (31) forecast (red harmonic) and with the simple and most reasonable working hypothesis of this paper (green line) that the “Golden Spike” temperature peak at about 2003 is the most recent peak in the millennial cycle. Akasofu forecasts a further temperature increase to 2100 to be 0.5°C ± 0.2C, rather than 4.0 C +/- 2.0C predicted by the IPCC. but this interpretation ignores the Millennial inflexion point at 2004. Fig. 12 shows that the well documented 60-year temperature cycle coincidentally also peaks at about 2003.Looking at the shorter 60+/- year wavelength modulation of the millennial trend, the most straightforward hypothesis is that the cooling trends from 2003 forward will simply be a mirror image of the recent rising trends. This is illustrated by the green curve in Fig. 12, which shows cooling until 2038, slight warming to 2073 and then cooling to the end of the century, by which time almost all of the 20th century warming will have been reversed. Easterbrook 2015 (32) based his 2100 forecasts on the warming/cooling, mainly PDO, cycles of the last century. These are similar to Akasofu’s because Easterbrook’s Fig 5 also fails to recognize the 2004 Millennial peak and inversion. Scaffetta’s 2000-2100 projected warming forecast (18) ranged between 0.3 C and 1.6 C which is significantly lower than the IPCC GCM ensemble mean projected warming of 1.1C to 4.1 C. The difference between Scaffetta’s paper and the current paper is that his Fig.30 B also ignores the Millennial temperature trend inversion here picked at 2003 and he allows for the possibility of a more significant anthropogenic CO2 warming contribution. The author would like to acknowledge all those in the climate science community who have contributed to the massive accumulation of the basic instrumental and proxy climate data that has taken place in the last thirty years, without which empirical climate science would have no foundation. I also appreciate the very apposite comments and suggestions made by one of the anonymous reviewers and the assistance of my wife Hilary in the adaptation of a number of the figures for the Journal publication. 1. Essex. Believing six impossible things before breakfast, climate models, www.youtube.com/watch?v=hvhipLNeda4 (2013, accessed 16 December 2016). IPCC. Summary for policymakers. p. 12 [Figure 5]. In: Stocker TF, Qin D, Plattner G-K, et al (eds) Climate change 2013: the physical science basis. Contribution of working group I to the fifth assessment report of the intergovernmental panel on climate change]. Cambridge: Cambridge University Press, 2013. Solomon S, Qin D, Manning Z, et al (eds). Contribution of working group I to the fourth assessment report of the intergovernmental panel on climate change. Cambridge: Cambridge University Press, 2007, para 8.6.4. IPCC. Summary for policy makers [note 16, p.16]. In: Stocker TF, Qin D, Plattner G-K, et al. (eds) Climate change 2013: the physical science basis. Contribution of working group I to the fifth assessment report of the intergovernmental panel on climate change. Cambridge: Cambridge University Press, 2013. 6. O’Neil C. Weapons of math destruction. 1st ed. New York: Crown Publishers, 2016, p. 3, 12. Harrison S and Stainforth D. Predicting climate change, p. 111, http://onlinelibrary.wiley.com/doi/10.1029/2009EO130004/pdf (2009, accessed 16 December 2016). Humlum O. An overview to get things into perspective, Figure 3, www.climate4you.com/ (2016, accessed 16 December 2016). Christiansen B and Ljungqvist FC. Clim Past 2012; 8: 765–786, www.clim-past.net/8/765/2012/ (accessed 16 December 2016). Mann ME, Bradley RS, Hughes MK. Northern hemisphere temperatures during the past millennium: inferences, uncertainties, and limitations [Figure 3, p. 361]. Geophys Res Lett 1999; 26: 759–762, www.meteo.psu.edu/holocene/public_html/shared/articles/MBH1999.pdf. Esper J, Cook ER, Schweingruber FH. [Figure 3] Low-frequency signals in long tree-ring chronologies for reconstructing past temperature variability. Science 2002; 295: 2252–2253, www.sciencemag.org. Mann ME, Zhang S, Rutherford S, et al. Global signatures and dynamical origins of the little ice age and medieval climate anomaly [Figure 1, p. 1257]. Science 2009; 326: www.meteo.psu.edu/holocene/public_html/shared/articles/MannetalScience09.pdf. RSS data. using Wood for Trees, ). Hadcrut4gl.1980 – Present, using Wood for Trees, www.metoffice.gov.uk/hadobs/hadcrut4/data/current/time_series/HadCRUT.4.5.0.0.monthly_ns_avg.txt (accessed 16 December 2016). Steinhilber F, Abreu JA, Beer J, et al. 9,400 years of cosmic radiation and solar activity [Figure 4], https://epic.awi.de/30297/1/PNAS-2012-Steinhilber-1118965109.pdf at www.pnas.org/lookup/suppl/doi:10.1073/pnas.1118965109/-/DCSupplemental (2012 accessed 16 December 2016). Rampino M, Sanders JE, Newman WS, et al. Long range forecasts of solar cycles and climate change [chapter 25]. In: Landscheit T (ed.) and The suns orbit 750–2050 [Chapter 26]. In: Fairbridge R (ed.). New York: Climate. Von Nostrand Rheinhold Co., 1987, pp. 421–541. Kern AK, Harzhauser M, Piller WE, et al. 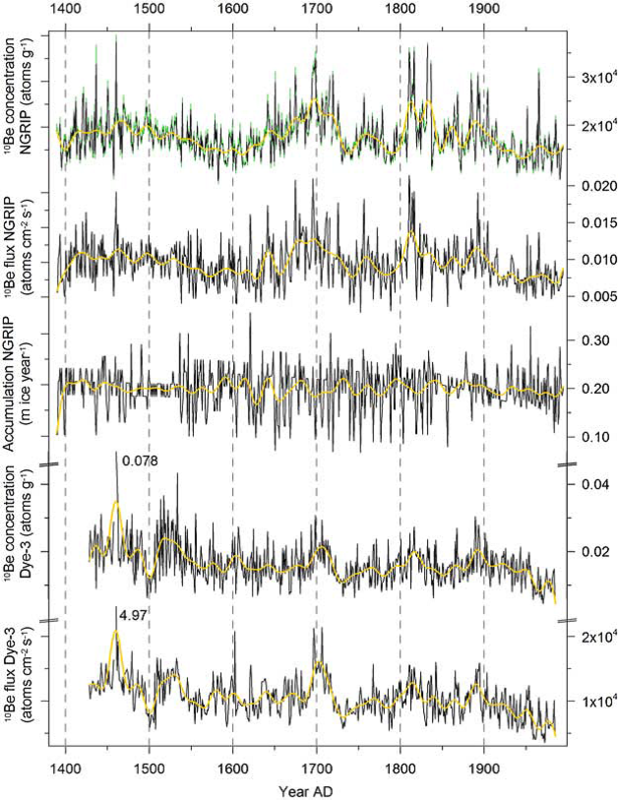 Strong evidence for the influence of solar cycles on a Late Miocene lake system revealed by biotic and abiotic proxies, 2012, pp. 124–136, http://dx.doi.org/10.1016/j.palaeo.2012.02.023. McKay NP and Kaufman DS. An extended Arctic proxy temperature database for the past 2,000 years, www.nature.com/articles/sdata201426, http://dx.doi.org/10.1038/sdata.2014.26 (2014, accessed 16 December 2016). Had SST 3 data, http://www.cru.uea.ac.uk/cru/data/temperature/HadSST3.pdf (accessed 16 December 2016). Berggren AM, Beer J, Possnert G, et al. A 600-year annual 10Be record from the NGRIP ice core Greenland, onlinelibrary.wiley.com/doi/10.1029/2009GL038004/full (2009, accessed 16 December 2016). Steinhilber F, Abreu JA, Beer J, et al. 9,400 years of cosmic radiation and solar activity from ice cores and tree rings, www.pnas.org/cgi/doi/10.1073/pnas.1118965109 (2012, accessed 16 December 2016). 27. Oulu Neutron Monitor data, http://cosmicrays.oulu.fi/#database (accessed 16 December 2016). Usoskin I, Schussler M, Solanki SK, et al. Solar activity over the last 1150 years, https://www.researchgate.net/publication/41624745_Solar_activity_over_the_last_1150_years (2005, accessed 16 December 2016). Humlum O. Climate4you graph. 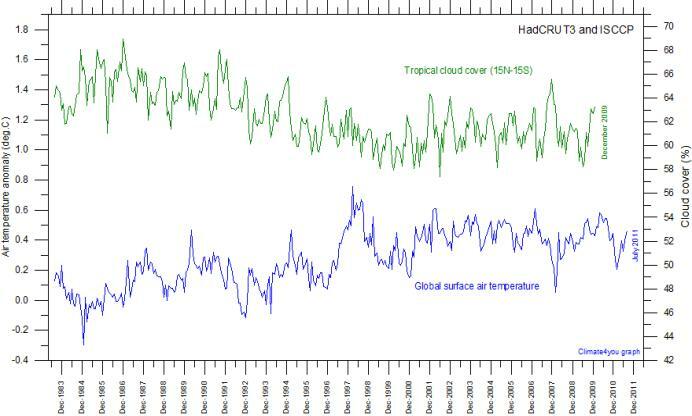 Tropical cloud cover and global air temperature, www.climate4you.com/ (2011, accessed 16 December 2016). 30. 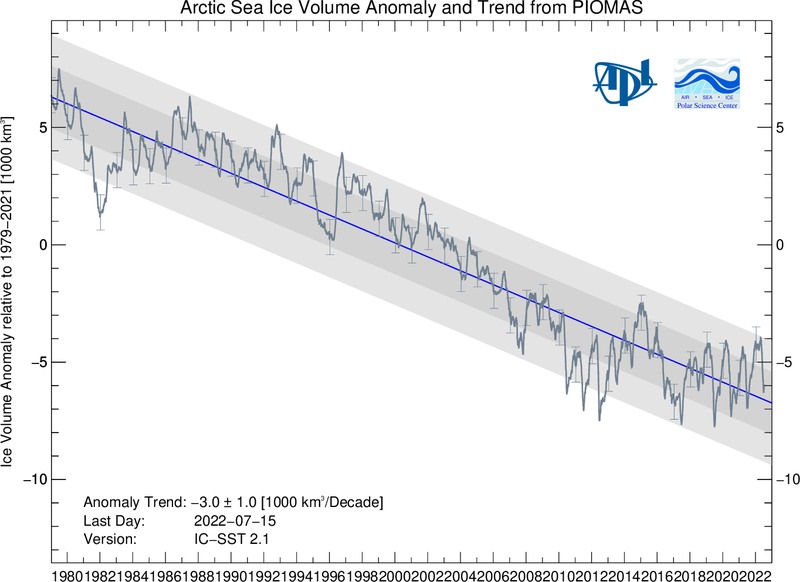 Polar Science Center: Arctic sea ice volume and trend from PIOMAS, http://psc.apl.washington.edu/wordpress/wp-content/uploads/schweiger/ice_volume/BPIOMASIceVolumeAnomalyCurrentV2.1.png (accessed 16 December 2016). Easterbrook. Evidence for predicting global cooling for the next three decades, www.globalresearch.ca/global-cooling-is-here/10783 (2015, accessed 16 December 2016). Thank you for a great article. I enjoyed the conclusions that were presented. Of course, the author used scientific data and analysis from sources that I recognized as being credible. I arrived at the basic same conclusions based on many sources. 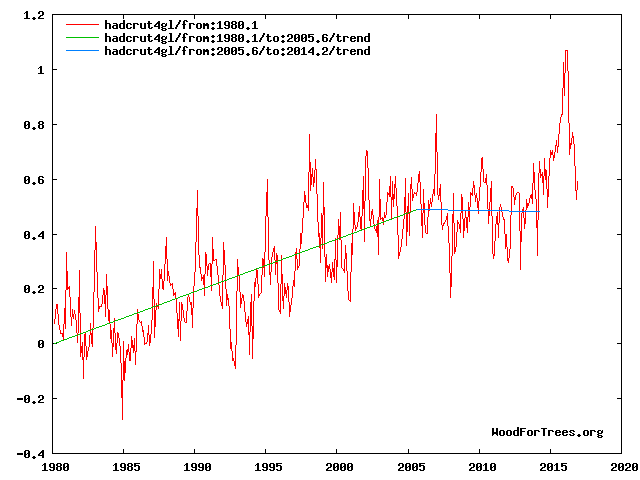 My interest in Climate change began after the "Hockey Stick" coverup first appeared. It became more of an interest when further discrepancies surfaced. Knowledgeable scientists helped me cement my opinions that AGW was false and when political pressures began to spread their form of propaganda. The scientists who influenced my thinking included He3nik Svensmark, Dyson Freeman, Don Easterbrook and many other sources including publications such as Debunk, WUWT, CFACT etc. Thanks for your kind words. Anything you can do to spread the word by providing links to this website or the paper on social media or climate web sites would be appreciated. I wish policy makers would read that Note 16 and understand what it means – as you did. “IPCC states that the climate feedback parameter is “likely” between 2,47 and 0,82 (W/m2*K). This corresponds to an equilibrium climate sensitivity of 1.5°C and 4.5°C respectively. IPCC also states that: “no best estimate for equilibrium climate sensitivity can be given because of a lack of agreement on values across assessed lines of evidence and studies”. Based on these figures the theory put forward by IPCC would allow warming of the oceans anywhere in the range from 0,0043 K to 0,087 K.
As there are also other uncertainties, I will allow myself to round off the figures. The theory put forward by IPCC in the fifth assessment report would allow warming of the oceans from 0 to 2000 m between 2005 and 2015 anywhere in the range from 0 K to 0,1 K.
"Forward projections made by mathematical curve fitting have no necessary connection to reality"
That is an important realization. By Fourier analysis any kind of time series can be fitted, and expanded into the future by Fourier synthesis. However, Fourier analysis can not tell us if the periods, amplitudes, and waveforms that are used to fit the time series actually exists. Most likely they don´t. Fourier analysis does not identify any of the physical relationships that affects the measurand. The stock market is clearly a random process as confirmed by historical data. Hence, curve fitting is useless as you contend. However, historical records of global temperature, correlated with solar system orbital dynamics have consistently trended. Hence, curve fitting becomes a meaningful process. Not perfect but meaningful. "If the real climate outcomes follow trends which even approach the near-term forecasts in paragraph 3.3 above, the divergence between the IPCC forecasts and those projected by this paper in Fig. 11 (green line) will be so large by 2021 as to make the current confidence level in the establishment IPCC forecasts untenable." That is a quite clear and near prediction, I might even be around to see it. Excellent paper and quite close to the truth of climate change drivers.